North Pole: a new garbage patch? In the great oceans of the world plastic debris accumulates in five great circular currents called gyri. These Five gyri are driven mostly by Westerly winds and influenced by the Coriolis effect causing a bend of 20-45° to the right, on the northern hemisphere. On the southern hemisphere the gyre moves counter clockwise. Pacific and Atlantic garbage patches. Two notorious gyri lie the Pacific: the North Pacific Gyre and South Pacific Gyre. The North Pacific Gyre became known as the ‘Great Garbage Patch’, because of its accumulation of large quantities of plastic. Most is runoff from highly populated coastal cities, and from maritime activities such as fishing and shipping. Its estimated to consist of 100.000 billion tons of garbage. Mostly larger pieces, but also smaller pieces. The smaller pieces pulverize under the influence of salt water and photo degradation, and enter the food chain of marine mammals, fishes, tortoises and the albatros. These high density particles are difficult to spot with the naked eye and can sink to lower layers of the oceans. The South Pacific gyre is now on its way to beat the Northern gyre, pollution wise: 18 tons of plastic recently reported on Henderson island a part of the Pitcairn group. This beats all records. In the Alantic ocean we find two similar circular currents: the Southern and Northern Atlantic gyri. Originally documented in 1972, the North Atlantic Gyre is another area of man-made floating marine debris. This patch is estimated to be hundreds of kilometres across in size,with a density of over 200,000 pieces of debris per square kilometer (see picture above). Which means that it contains plastic marine pollution in a pattern and amount similar to what has been found in the Great Pacific Garbage Patch. A sixth garbage patch: the North pole Plastic accumulation at polar latitudes was sofar considered as unlikely, because of the lack of nearby pollution sources (I am not considering the pollution caused by oil rigs in the Nordic seas here). A different picture was presented by a recent study* that extensively sampled the Arctic Ocean for floating plastic debris. Although human population north of 60° latitude is relatively low, and plastic debris was scarce or absent in most of the Arctic waters, it reached high concentrations (hundreds of thousands of pieces per square kilometer) in the northernmost and easternmost areas of the Greenland and Barents seas. The fragmentation and typology of the plastic suggested an abundant presence of aged debris that originated from distant sources, most likely Western Europe and Eastern US. The source of the plastic is the North Atlantic garbage patch, which is transported northward by a gulfstream known as thermohaline circulation, also called ‘conveyor belt’ (see insert). 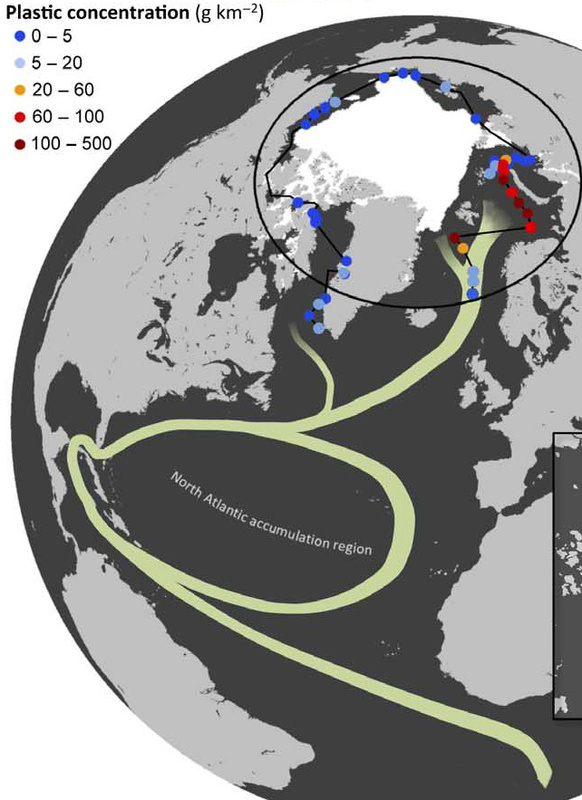 The oceanic pathway was tracked back from the Arctic using satellite observations and floating buoys. This showed that the poleward branch of the thermohaline circulation transfers floating debris from the North Atlantic to the Greenland and Barents seas. Areas which would be a dead end for the plastic conveyor belt. When the warm water of the gulfstream reaches Nordic seas it sinks to lower layers of the water, while the plastic particles accumulate in the colder surface layers in the northern part of the Nordic areas. Areas that are already in the red zone due to global warming of the earth and massive melt down of glaciers in Greenland, and the sea ice at the North Pole. What to do? Stopping with the production of plastics altogether appears to be the most radical solution. Another is to stop using single use plastic: plastic bags, plastic bottles, plastic to-go containers, plastic takeaway cups, and plastic straws. Which means: practically all articles sold in our Super Markets. Stop buying that stuff would perhaps be a sensible thing to do. Unfortunately, in our modern society ''anything that interferes with one's personal feeling of comfort and well being is regarded as suspicious. What feels nice is accepted blindly. But any type of information -including expert reports- suggesting that we should change our life style or bring sacrifices, is often set aside as manipulation or hysteria''(1). Then there is of course also the Prisoners Dilemma explanation: 'why should I make sacrifices by changing my life style, if my fellow citizens (also reasonable people) do not have that same intention? Why to be soft in a tough world?' But, as far as plastic is concerned there are better alternatives, such as mass production of biobased instead of oil based polymers, called PEF (or polyethylene furanoate) a next generation plastic. But for the near future it looks like the world has to face the reality of a plastic soup that degrades life in the oceans, and possibly will further accumulate and spread to seas that have so far been spared. (1) Here I quote Bas Heijne, in his weekly NRC column of April 22.